It’s four days before the non-waiver trade deadline, and things figure to pick up during the weekend. 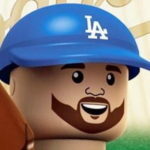 The Dodgers have been rumored to be in on just about everyone. Almost literally. But the biggest fish in this pond is Chris Sale, who would not come cheap. Sale, 27, is one of baseball’s five best pitchers. Despite his jersey-slashing incident last weekend, his trade value has never been higher — mostly because he has never been available. With the White Sox playing .500 ball this season and an aging roster, it might be prime time for them to move Sale, especially in this barren market. They’ll probably never get more for him in a trade than they will right now. Still, his incredibly team-friendly contract doesn’t mean they absolutely must trade him. He is owed $12 million in 2017 and has team options for 2018 and 2019 at $12.5 and $13.5 million, respectively (each year with a $1 million buyout). That only makes his value even higher. Oh, and he’s really good at pitching. 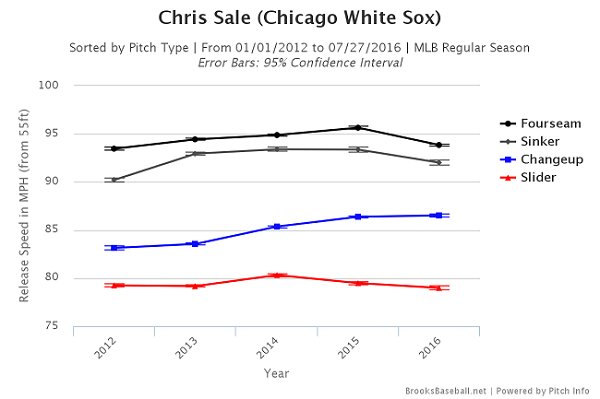 Despite having one of the most unorthodox deliveries in the game, Sale has been one of the most prolific pitchers since he moved into the White Sox’s rotation back in 2012. From 2012 through 2015, he posted a 2.95 ERA, 2.95 FIP, 2.90 xFIP, 28.3 K%, 5.6 BB%, 22.7 K-BB%, 12.3 SwStr% and 21.1 FanGraphs wins above replacement (5.3 average per season). This season, he’s still pitching well, but he has taken a step back in almost every category. His 3.18 ERA is better than the 3.41 mark he posted last season, but his FIP has jumped to 3.69 from 2.73 last season. The biggest red flag is the reduced strikeout rate, which has fallen from 32.1 percent last season to 24.5 percent this season, and his per nine rate has fallen from 11.8 K/9 last year to 8.7 this season. Both the percentage and per nine rates still check in as “great” and “above-average,” according to FanGraphs, but it’s a far cry from the better-than elite levels he was posting just last season. Another cause for concern is the reduced velocity on his fastball. He averaged 95.6 MPH on his 4-seam fastball last season. This season, it’s down to 93.8 — still borders on plus-plus velocity (especially from a left-handed starter), but it’s down almost 2 MPH. Strangely, his changeup velocity has been on the rise since he became a starter. The diminished fastball velo isn’t nothing, but there might be reasoning behind it. Sale has changed his approach this season, and he’s still doing quite well at getting hitters out. He’s pitching to contact. It isn’t just a myth — it’s an actual thing. But has it actually helped him remain in games longer? The stats say yes, even if only a slightly. Last season, Sale averaged 3.89 pitches per plate appearance, 6.7 innings per start, and 107 pitches per start, and this season he’s averaging 3.83 P/PA, 7 IP/GS and 106 P/GS. Sure, it works out to one more out in one fewer pitch, but over the course of a season, that’s 33 extra outs and 33 fewer pitches. Sale’s exit velocity against has, unsurprisingly, jumped 2.7 MPH from 86.2 last season to 88.9 this season. That’ll happen when hitters are making contact 7.4 percent more than they did last season against Sale. Conversely, his swinging strike rate has dipped 4 percent from 14.6 to 10.6. Sure, it’d be nice if he were still striking out hitters at a Clayton Kershaw level, but he has made an adjustment that he feels is making him a better, more reliable pitcher. Going from a team that has -6 defensive runs saved to a team with 27 DRS could also result in more outs and fewer pitches per batter. The asking price is going to be, understandably, astronomical. The talks start and end with Julio Urias. Chris Sale does not ever don a Dodger uniform if Urias isn’t heading to Chicago. It’s a high price to pay, but for this team right now, it might be worth it. It’d take a couple other legitimate prospects — think two of Yadier Alvarez, Cody Bellinger, Jose De Leon, Alex Verdugo, along with a fourth piece in the form of a Austin Barnes, Willie Calhoun, Jharel Cotton, Yusniel Diaz or even the injured Walker Buehler. Of course, the Dodgers could shock everyone and include Yasiel Puig with Urias and another from the second tier of prospects to see if that entices Chicago. For a guy like Sale, you might even have to make Joc Pederson available. Still, there’s no guarantee this would be enough to get the White Sox to move Sale. Even with all the clubhouse BS that appears to be going on over there, they still have no real incentive to move him for less than a premium return. Chris Archer seems a lot more realistic a trade acquisition before Monday than Sale, but if the Dodgers want to shoot really big and get a guy who could fill in for Kershaw (as much as one pitcher can) if he isn’t able to pitch again this season, Sale might be the prime target. Plus, he’s signed through the 2019 season and would be the Zack Greinke to Kershaw’s … Kershaw for at least a couple of seasons.